Globe arborvitae plants are cultivars of "Thuja occidentalis" and belong to the Cupressaceae family. Popular globe forms of arborvitae include "Golden Globe" and "Rheingold." The globe arborvitae is a dense, multi-stemmed evergreen shrub with a rounded form. It forms a rounded ball that is about 5 feet tall and wide. The large shrubs make attractive accent plants and require little attention. They do not require severe pruning, but light pruning helps stimulate new growth and gives the shrub a more ornamental shape. Allow the arborvitae to assume its natural globe shape, pruning accordingly. Prune the globe arborvitae in late fall or early winter, before the candle growth develops in the spring. Use small hedge shears to cut off a few of the oldest and tallest branches, removing them at or slightly above ground level to renew the plant. Cut back the previous year's growth about 1/4 to 1/2, encouraging a thick-growing plant. Cut back to dormant buds located near the main body of the plant. Thin the plant out to shorten long branches and maintain a symmetrical dome shape. Cut the long branches off at their point of origin, from either the parent stems or ground level. Thinning results in a more open bush, emphasizing the branches' internal structure. It also strengthens the plant by forcing diameter growth of the remaining branches. Prune out some of the center growth to open the plant -- but do not remove the central stem. Cut back the branches to buds that point outward. Lightly prune the plant to give it a more ornamental shape, keeping the base broader than the top. When shortening a branch, cut it back to a side branch. Make the cut 1/2-inch above the bud. If it's too close to the bud, the bud may die. If it's too far from the bud, the tips on the end of the branch may die. Remove dead limbs to avoid insect and disease problems. Cut them off flush with the main stem. Remove diseased or insect-infested branches, cutting them back to the nearest living lateral branch or the main stem. If you cut to a lateral branch, choose one that forms an angle of no more than 45 degrees with the branch you're removing. The lateral branch should have a diameter of at least 1/2 that of the one being removed. 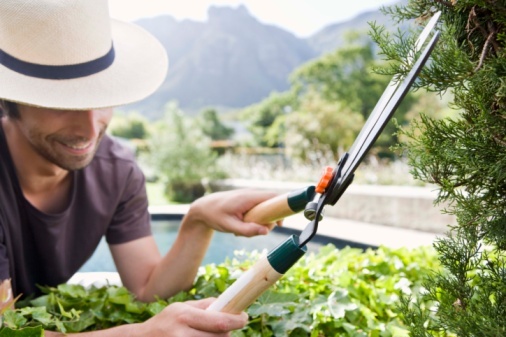 Wash the shears between cuttings to avoid spreading disease. Remove feathery new growth during the growing season if it changes the shape of the plant.